The Federal Government may have created a judicial scenario capable of causing nationwide confusion that may make or mar next month’s general election if not handled with high level intelligence and on time. 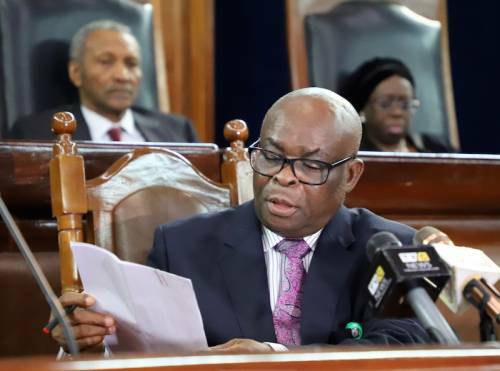 Leading socio-cultural bodies in the South East, South South and Middle Belt of Nigeria including constitutional lawyers have observed unmanageable constitutional and breach of court process in the sudden suspension of Chief Justice of Nigeria (CJN), Mr. Walter Onnoghen today, Friday, January 25, 2019. The Federal Government seems to have relied on the ruling of the CCT which had been taken over or superseded by the latest ruling yesterday, of the Appeal Court which ordered suspension of the trial pending the determination of the substantive suit before Court of Appeal. Already, the presidency did not stop at suspending the CJN, but went ahead to appoint and swear in Tanko Mohammed in acting capacity all on Friday. However, in a swift joint reaction, the coalition of Southern and Middle Belt Leaders has has described the presidential act as “a coup against Constitutional Democracy in Nigeria by President Muhammadu Buhari by the Suspension of CJN Walter Onoghen this evening and swearing in a replacement”. While observing that “This is a constitutional crisis foisted by desperation and morbid desire to foist rule of thumb,” they averred that “We have checked through the constitution and the President has no power to unilaterally suspend the CJN. Section 292 of the amended 1999 Constitution is clear that the President can only remove the CJN with 2/3 of Senate resolution”. “The latest action is a clear suspension of the constitution and enthronement of full blown dictatorship. “We reject the illegal suspension and demand its immediate reversal. The suspension is null and void and of no effect whatever. “An emergency meeting of the Forum holds shortly on this total aberration. We call on all Nigerians to wake up to the reality that our democracy is now under threat and use all constitutional means to defend it. “We must not surrender to this authoritarian rule. The terse statement was signed by the regional leaders including Chief E K Clark for the South South, Chief Ayo Adebanjo for the South West, Chief John Nwodo, Ohaneze President and for the South East, and Dr Pogu Bitrus, representing the Midddle Belt Groups. (2) Any person who has held office as a judicial officer shall not on ceasing to be a judicial officer for any reason whatsoever thereafter appear or act as a legal practitioner before any court of law or tribunal in Nigeria”. A review of appointments in the nation’s judicial agencies suggest yet a regional dominance like the national security architecture. For example, where as the EFCC is headed by Ibrahim Magu, NFIU- Hamman-Tukur, Police- Mohammed Adamu, DSS- Bichi, NIA- Ahmed, AGF – Abubakar Malami, Appeal Court – Bulkachuwa, High Court – Abdul Kafarati and now, Supreme Court – Tanko Mohammed. Besides, opposition political parties under the aegis of Coalition of United Political Parties (CUPP), has asked the Senate to reconvene immediately and begin impeachment move against President Muhammadu Buhari for suspending the Chief Justice of Nigeria, Justice Walter Onnoghen in variance to the ruling of Court of Appeal on the matter. National spokesman of the CUPP, Imo Ugochinyere, said this in a statement made available to journalists in Abuja that “The Senate should reconvene now and start impeachment process against the President for acting against the provision of the Constitution he swore to uphold. “A man who rode to power on the basis of respect for the rule law and fundamental principles of democracy has chosen to play to the gallery of dictatorship to rig elections. Let’s see how it goes. Observers say such moves may shock the upcoming national election in one way or the other. In another development, Chief Olisa Agbakoba, SAN, in his reaction described the act as the highest abuse of rule of law and court processes in Nigeria and called on all justices and stakeholders in the judiciary to embark on protest against the height of judicial and constitutional bleeding capable of embarrassing the judiciary and nation’s common sense. 9. The real effect has been a stalling of the trial of Justice Onnoghen, helped along by lawyers who insist that these orders, whether right or wrong are technically valid, and must be obeyed till an appellate Court says otherwise. No doubt that it is the proper interpretation, but is it right disposition for our nation? Thank you and may God bless our country, Muhammadu Buhari.